I did a write up on Kiko Mizuhara's outfit previously, check it out if you haven't. Ai Tominaga who also modeled for the collection made sure she didn't wear the same dress. She opted for a stunning flowy dress from the collection with a high slit. Stunning. I absolutely adore Angela's suit. A very daring outfit from the Spring/Summer 2011 collection. The adrogynous look works for her, I would love a bold non-glossy red lip. Some of you may not like what actress Shinobu Terajima wore but I thought she looked great in the jumpsuit. Would love to see it in motion. Model Elli-Rose wore a dress/coat from Louis Vuitton Resort 2011. Do you think the puffy look works for her? I'm not big on her outfit but it was well accessorized. 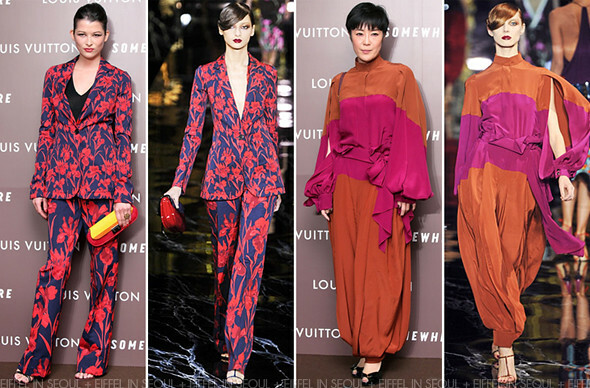 ICONIQ also opted for an entire outfit from Louis Vuitton Resort 2011 collection. I'm not a fan of the look. I would prefer if she wore long tailored pants.